Because of the large altitudinal gradients, the vegetation of the Caucasus and Transcaucasia is divided both vertically and horizontally, and classified into zones and locally based series of altitudinal bands of vegetation. Gulisashvili et al. 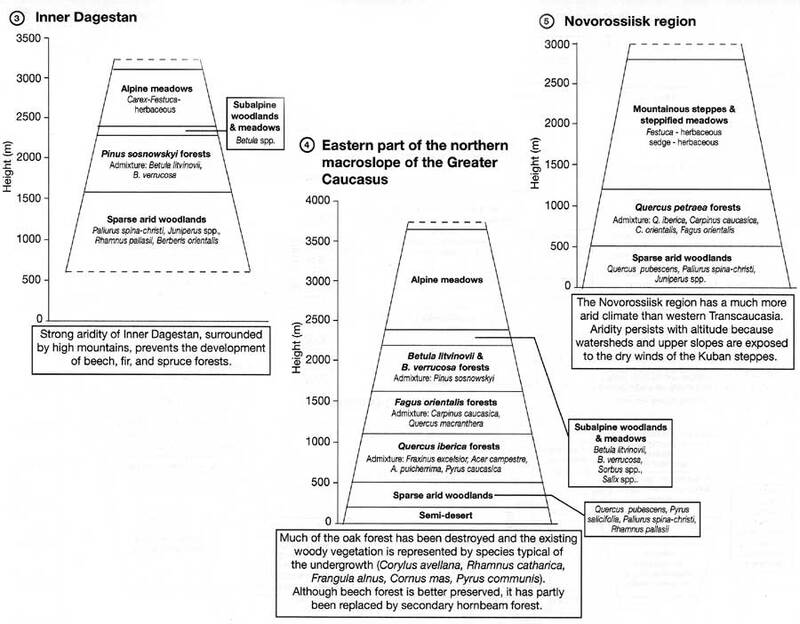 (1975) recognize seven such zones, which replace one another with zonally and meridionally changing climate and increasing altitude, and fourteen regionally based altitudinal sequences (Figure 15.4). 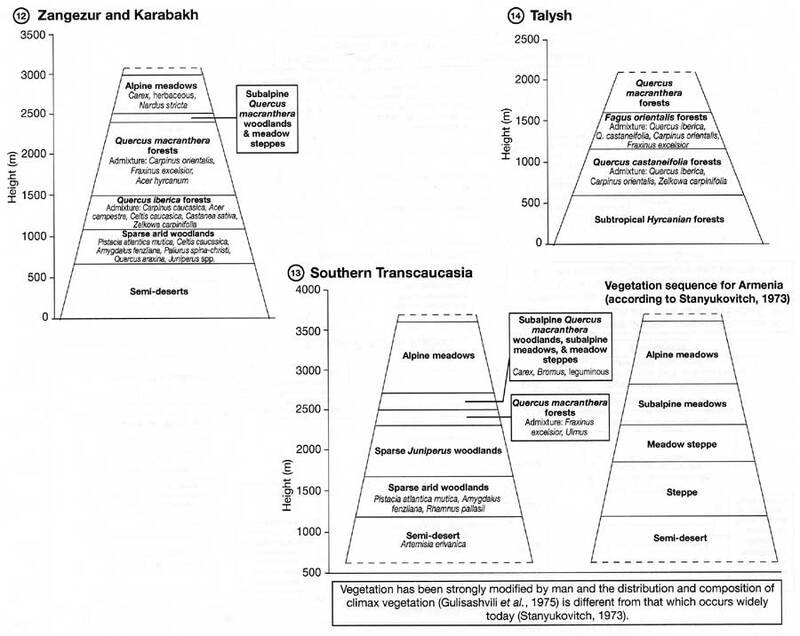 Deserts and semi-deserts occur in the eastern Caucasus and in Transcaucasia (Figure 15.5). While semi-deserts represent zonal vegetation, desert vegetation develops locally on solonchak soils and unconsolidated coastal sands. Semi-deserts reach different altitudes. Thus, in southern Armenia and Nakhichevan, which have a very arid climate, the upper boundary of semi-desert vegetation is located at an altitude of 1000-1500 m, while at the western boundary of its distribution semi-deserts are succeeded by sparse arid woodlands already at an altitude of 200-250 m. In the system of vertical vegetation belts, semi-desert vegetation is often referred to as mountainous xerophytes or phrygana vegetation. Mountainous xerophytes, which may be both primary and secondary successions, form a continuous altitudinal belt in Dagestan, southern Armenia, and Nakhichevan and occur locally on the central northern macroslope of the Greater Caucasus, in the eastern Greater Caucasus and in Karabakh. The primary xerophilous communities are floristically rich and comprise numerous associations whose development is controlled by topography, altitude, aspect, chemical composition of rocks and soils, the extent of weathering, and development of soil profiles. For example, in Nakhichevan, 807 xerophilous species occur on the plain while mountainous xerophytes comprise 1761 species (Gulisashvili et al., 1975). Steppes occur both in the Caucasus and Transcaucasia. In the western and central parts of the Caucasus Foreland steppes represent zonal vegetation. However, natural ecosystems, dominated by species of Stipa, have been largely replaced by agricultural lands. 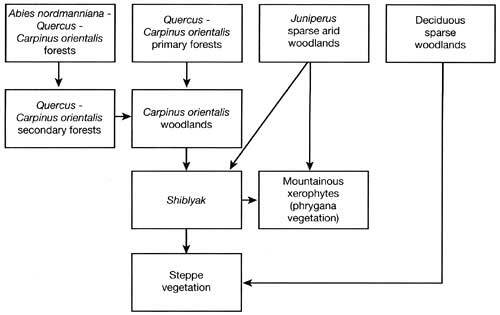 The secondary steppe communities include meadow steppes that develop on the Stavropol upland and in the lower mountains of the northern macroslope of the Greater Caucasus (the latter have developed in place of oak forests). Steppes dominated by Botriochloa ischaemum, the most widespread herbal species in sparse arid woodlands, occur in the foothills and middle mountains of Dagestan (800-1800 m), indicating that woodlands once prevailed here. In Transcaucasia, steppes have an azonal distribution developing on plains and in the foothills as well as in the middle and upper mountains of Armenia. Most of the Transcaucasian steppes replaced woodlands a few centuries ago as land was cleared for agriculture and later abandoned. For example, the shores of Lake Sevan, dominated by steppe vegetation, were previously forested. Fragments of undergrowth typical of forests composed of Ouercus macmnthera are still found in the region as well as numerous remains of forest faunal species found in burials of the late Bronze and Iron Ages. Similarly, the northern slopes of the Bzovdal and Pambak Ridges of the Lesser Caucasus, mountains of Dzhavakhetia and Armenia, dominated by steppe vegetation, contain remnants of Quercus macranthera forests. The fact that forests once prevailed here is reflected in the names of local villages that translate as oak grove, pine wood, etc. The secondary steppe communities are often mistaken for the original ones because not only vegetation but also soils have changed. However, the transformation of soils has not been completed. 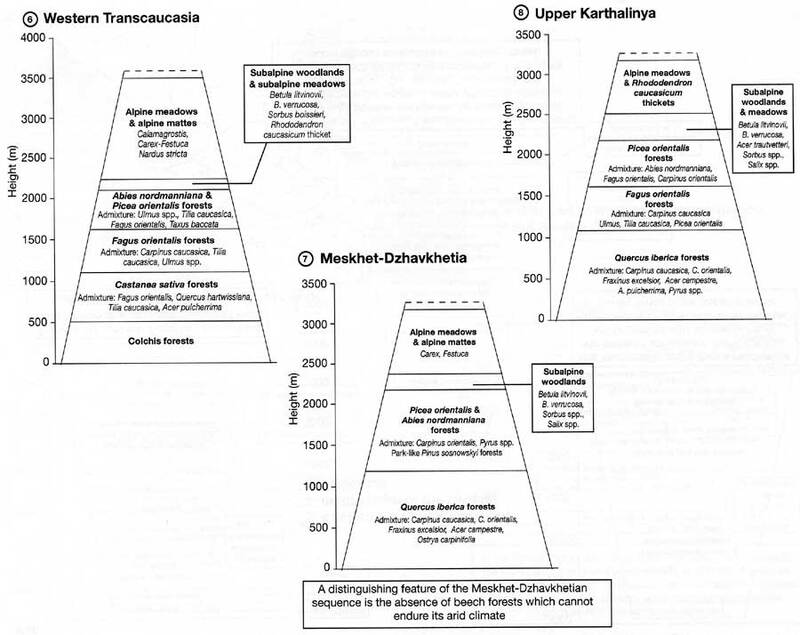 For example, although soils in the Dzhavakhetian steppes resemble chernozem, the deeper layers are still poor in bases, have a slightly acid reaction and a texture typical of the brown forest soils. 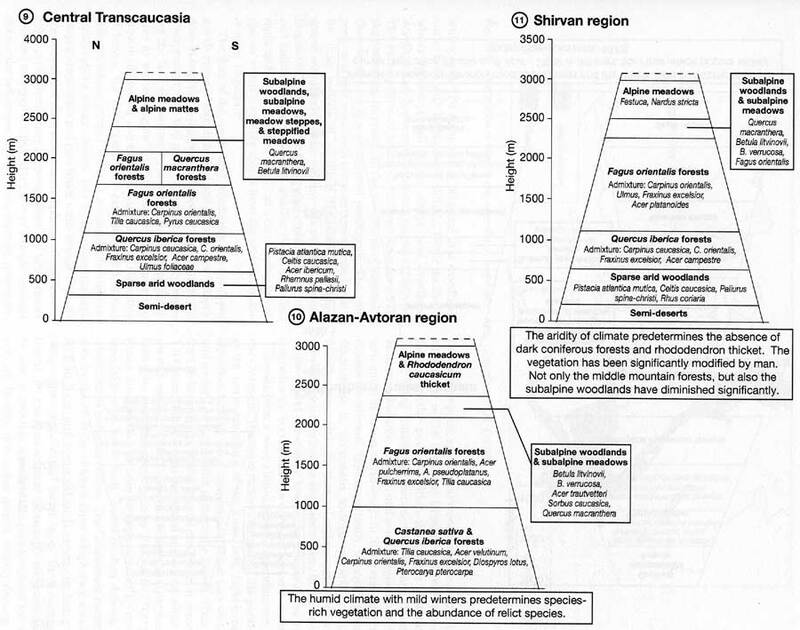 It is often argued that all steppe formations in Transcaucasia are secondary successions (Gulisashvili, 1964; Gulisashvili et al., 1975). Little of the primary forest-steppe vegetation has survived and this is limited to the northern macroslope of the Greater Caucasus. Woody vegetation is represented by Ouercus petraea, Tilia caucasica, Acer campestre, and Betula while species typical of meadow steppes and steppifled meadows occur in the herbaceous cover. In Transcaucasia and the eastern Caucasus, the transitional zone between semi-deserts and forests is occupied by sparse arid woodlands which are analogous to forest-steppes and are often referred to as 'forest-steppes of the south'. Sparse arid woodlands were a zonal type of vegetation in eastern and southern Transcaucasia (foothills of the Greater and Lesser Caucasus, Armenian-Dzhavakhetian plateau, and Karabakh) while in Dagestan they constituted a well-defined altitudinal belt before they were degraded by human activities. The contemporary biogeography of the sparse arid woodland zone is predominantly cultural, not natural, and untouched woodlands have survived in limited areas most notably in eastern Georgia, Azerbaijan, and Karabakh. In the climax ecosystems, the most common woody species are Pistacia atlantica mutica, Pyrus salicifolia, and Celtis caucasica. The bush and shrub tier is dominated by Punica granatum, Rhamnus pallasii, Paliurus spina-christi, Spiraea crenata, Cotinus coggygria, and Berberis orientalis. Botriochloa ischaemum is the most widespread species in the herbaceous cover; Lamarckia bromoides, Stipa capillata, Linosyris villosa, and species of Artemisia are also widespread. The composition of sparse arid woodlands varies both with latitude and altitude. While deciduous woody species prevail on the plains, arid woodlands developing on slopes usually contain species ofjuniperus. The participation of Juniperus becomes ber as the slope steepness increases. In the mountains of Karabakh, Quercus araxina is a widespread participant. The composition of arid woodlands becomes depauperate towards the drier regions of southern Transcaucasia, where sparse woodlands border on semi-deserts, and in inner Dagestan. Trees become rare, being replaced by shrubs, and individual plants become smaller. Rhamnus pallasii replaces Pistacia atlantica mutica as a dominating woody species which is notably absent from the arid mountains of inner Dagestan. The flora of the sparse arid woodlands has developed a wide range of morphological and physiological adaptations in response to seasonal variations in temperature and precipitation. The two most important climatic stresses are the lack of moisture in summer and low temperatures in winter (Figure 15.2). The temporal pattern of growth, flowering and fruiting, the seasonal shredding of leaves, the development of extensive vertical root systems where ground water is accessible, anatomical modifications which reduce loss of moisture through evapotranspiration and give better water storage capacity are examples of plant adaptations. Ephemeral grasses and herbs grow abundantly in spring when the temperature rises and moisture is sufficient while only drought-resistant Botriochloa ischaemum and Artemisia vegetate in summer. In many respects, sparse arid woodlands are akin to the savannahs of the Southern Hemisphere: both biomes have a similar position within the system of natural zones, being transitional between forests and deserts; landscape features, ecology, and plant adaptations have also much in common. However, in many ways the two biomes are different. Most importantly, seasonal climatic fluctuations in savannahs include marked dry and moist seasons while the thermal regime varies little and provides for a continuous vegetative cycle. In the biome of sparse arid woodlands, low winter temperatures predetermine the occurrence of a dormant period in winter. Forests form a wide altitudinal belt extending across the Caucasus. The main factors controlling the position of the lower boundary of the forest belt, include precipitation, humidity and temperature. These vary widely and so does the lower limit of montane forests. Thus in the Colchis lowland, where annual precipitation exceeds 1200 mm, climax forests developed at sea level while in the arid regions of inner Dagestan, Darlagez, and the Araks basin, the forest belt develops from 2000 m to 2700 m. Forest distribution has been bly affected by man, especially at its lower limit, and it is often difficult to determine its natural position. The Caucasus is remarkable for the diversity of forest types which vary greatly both in form and composition. However, in terms of composition of individual forest types, the Caucasian forests are less diverse: most formations are dominated by one or two tree species while polydominant forests are rare. Forests, rich in tree species, usually develop in marginal (e.g., gullies and steep slopes) or transitional habitats. By contrast, the undergrowth is species-rich in most forest formations. Dolukhanov (1966) distinguishes three main types of forests with regard to their evolution: relict Neogene forests (e.g., the Colchis and Hyrcanian forests), discussed on above; multi-aged forests with many relict species of the eastern Mediterranean, Asia Minor and Caucasian origin; and forests similar to the European ones. Four types of deciduous forests are most widespread: monodomin-ant beech (Fagus orientalis) and oak (Quercus) forests, and forests dominated by two species, oak and hornbeam (Quercus-Carpinus caucasica) and chestnut and hornbeam (Castanea sativa — Carpinus caucasica). The dark coniferous forests are comprised of spruce (Picea orientalis) and fir (Abies nordmanniana), which often contain an admixture of deciduous species. The light coniferous forests are comprised of species of pine (Pinus spp.) (Figure 15.6). In the past, oak forests occupied extensive areas and were dominant at low altitudes. These were largely destroyed as land was cleared for fields and vineyards. Domestic grazers have contributed to the destruction of oak forests by the consumption of shoots and young trees which prevented regeneration of forests. At present, oak forests survive mainly in protected areas, on slopes unsuitable for cultivation and in remote areas. There are many types of oak forests in the Caucasus and Transcaucasia and their undergrowth and herbaceous tiers contain more species than any other type of broad-leaved forest. There are seventeen species of oak in the region; fourteen of those are endemic; and nine serve as forest-forming species (Dolukhanov, 1966). The most widespread species is Quercus iberica (Figure 15.6a). The main ecological requirements of Quercus iberica are good drainage and low soil salinity. This is why it grows on slopes and is usually absent from plains and inter-montane depressions (Gulisashvili et al, 1975). In the eastern part of its distribution area, Quercus iberica occurs between 500-600 m and 1000-1100 m; in the west, it reaches 1800 m where it often mixes with Quercus macranthera (Gulisashvili, 1964; Dolukhanov, 1989). Three other species, which are better adapted to poor drainage, occasional inundations, and salinization of soil, occur on the lowlands of western Transcaucasia (Quercus imeretina and Q. hartwissiana) and eastern Transcaucasia (0. longipes). Containing about 30-40 woody species per hectare, the Q. longipes forests are particularly species-rich (Gulisashvili et al., 1975). Forests, composed of Q. robur, develop on the northern macroslope of the Greater Caucasus. Forests dominated by Fagus orientalis occupy the largest area (Figure 15.6c). Fagus orientalis is a moisture-loving species requiring 420-450 mm of precipitation per annum and relative humidity above 70 per cent (Lvov, 1964). In the western part of the Greater Caucasus and Transcaucasia, which have a humid climate, Fagus orientalis forests develop in the foothills and on the coastal plains. In the east, where precipitation is lower and summer temperatures are higher, Fagus orientalis forests develop from an altitude of 600-700 m mostly on the north-facing slopes. Generally, the optimal conditions occur in the lower mountains, between 900 and 1600 m where Fagus orientalis forests reach their highest productivity (Gulisashvili et al., 1975). Forests, composed of Castanea sativa with the admixture of Quercus and Fagus orientalis, have a more limited distribution in the Caucasus and Transcaucasia than oak and beech forests. Much of these forests have been destroyed because chestnut wood is very valuable. However, Castania sativa is demanding of both soil and climatic conditions and a relatively narrow range of habitats limits its distribution even in climax ecosystems. Castanea sativa is both a warmth- and moisture-loving species that requires acid soils. 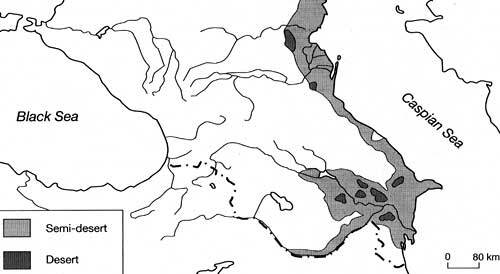 Its area of distribution is limited by the annual isotherm of 9°C and the isopleth of 700 mm (Gulisashvili et al., 1975). These requirements limit the distribution of Castanea sativa to the south-western part of the region. It grows especially well in western Georgia where in climax ecosystems chestnut forests develop from sea level to an altitude of 1200-1300 m (Figure 15.6d). 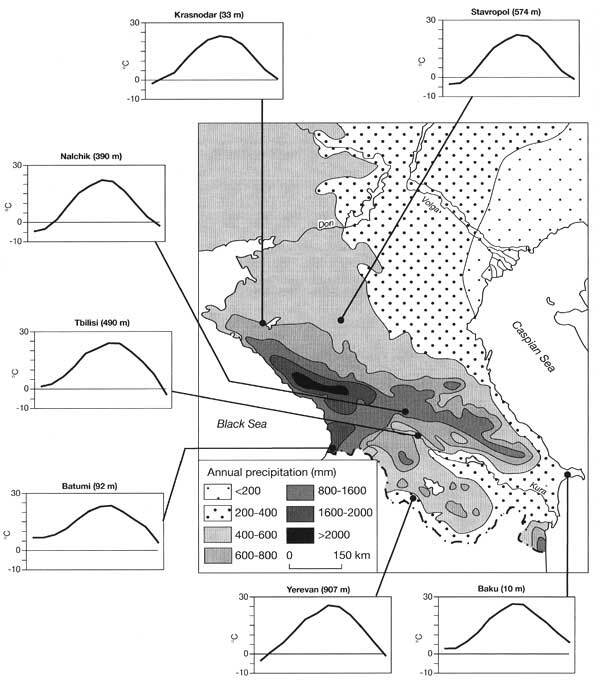 East of the Surami Ridge, the distribution of the chestnut forests, developing in the altitudinal belt of 500-1100 m, is limited by the lack of precipitation and often Castanea sativa occurs as an admixture to oak or beech rather than as a principal forest-forming species. Dark coniferous and mixed dark coniferous-deciduous forests are comprised of three main species or their combinations: Abies nordmanniana, Picea orientalis, Abies nordmanniana-Picea orientalis, and Abies nordmanniana-Fagus orientalis. 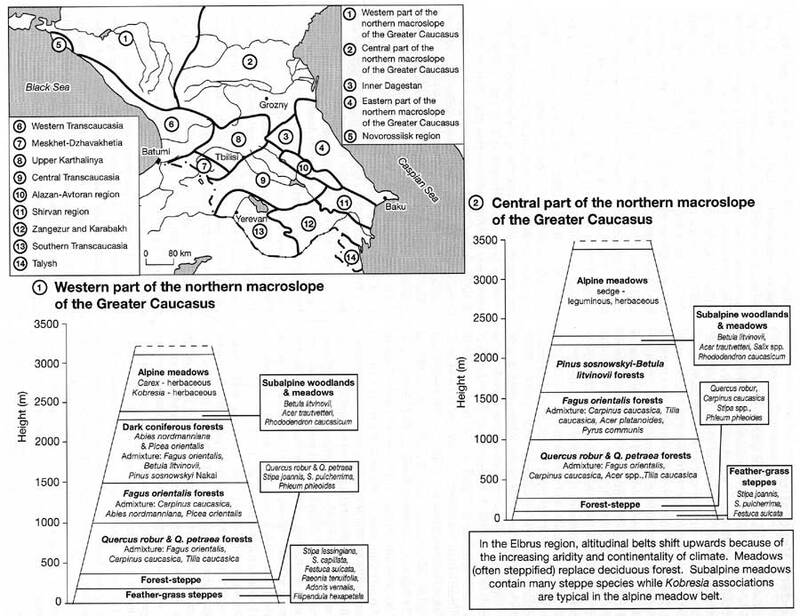 These are typical mainly of the western part of the Caucasus and western Georgia (Figure 15.6e) where they develop in the middle and upper part of the altitudinal forest belt between 900-1100 and 200-2200 m although there are regional variations (Figure 15.4). Further east, increasing aridity limits the development of dark coniferous forests and already in eastern Georgia, these forests develop in deep and narrow valleys on the north-facing slopes where fogs are frequent and humidity is high. Dark coniferous forests reach maximum productivity between 1400 and 1700 m. Average productivity is about 900 m3 ha-1 but in most favourable habitats it can reach 2500 m3 ha-1 with the canopy reaching 60 m above the ground (Orlov, 1951). Forests, composed of Abies nordmanniana, usually have a better developed and more species-rich herbaceous cover than Picea oriental's forests, with surface covers of 60-70 per cent and 30-50 per cent respectively. Picea forests usually have a well-developed moss cover with species of almost entirely boreal origin. Perhaps the most common tree species in the Caucasus is Pinus sosnowskyi Nakai which occurs as individually growing plants, small groves and large forest massifs (Figure 15.6g). Large massifs of pine and mixed pine-birch forests are typical of the Greater Caucasus while in the Lesser Caucasus (except Georgia) small groves prevail. The vertical limits of pine distribution vary across the region (Figure 15.4). On the northern macroslope of the Greater Caucasus, the lower limit of pine distribution varies between 100-200 m near the town of Makhachkala on the Caspian coast, through 600-700 m in the basin of the Baksan to 800 m in the basin of the Kuban, while in the arid region of inner Dagestan, pine grows from an altitude of 1200-1400 m. The floral composition of pine forests is relatively poor, largely because pine forests develop on steep rocky slopes with poorly developed soils and few other plants can endure such conditions. Species of birch (Betula verrucosa and B. litvinovii), oak (Quercus macranthera, Q. iberica, Q. petraea, and Q. pubescens), and, in more humid habitats, Picea orentalis, Acer campestre, Carpinus caucasica, Tilia cordata, and Sorbus caucasica form the most typical admixtures. Near the timber line, forests are succeeded by the subalpine woodlands or a thicket of dwarf, often creeping woody plants and shrubs. Gulisashvili et al. (1975) distinguish three categories of subalpine woodlands according to their species composition: the Colchis type, Hyrcanian-Caucasian type, and boreal type. They also recognize a transitional type of subalpine woodlands which occurs mainly in central Transcaucasia and comprises species typical of the other categories whose combination depends on local topography and aspect. Woodlands of the Colchis type develop in the western part of the Adzhar-Imerety Ridge facing the Black Sea and in the spurs of the Greater Caucasus in Abkhazia. These regions receive 2000-4000 mm of precipitation per year in the subalpine belt. In winter, which is milder than elsewhere, plants are well insulated by snow and even demanding species can survive at these altitudes. The subapline woodlands contain such typically Colchis species as Fagus orientalis, Betula medvedevii, Quercus pontica, Rhododendron ponticum, and R. caucasicum. Other species (e.g., Abies nordmanniana and Acer spp.) are typical representatives of the Colchis subalpine woodlands but they are found in the other regions too. For example, elements of the Colchis subalpine woodlands occur on the southern macroslope of the Greater Caucasus although boreal species prevail there. The boreal subalpine woodlands dominate in the Greater Caucasus. Boreal subalpine woodlands are represented by Betula, Pinus, and mixed Betula-Sorbus types. Similar to the Hyrcanian forests, the Hyrcanian subalpine woodlands have a very distinct flora. Acer hyrcanum and Quercus macranthera are the main woodland-forming species, Pyrus syriaca and P. zangezura prevail in admixture, while Sorbus spp. and Juniperus pigmea are the most common shrubs. In contrast to the other regions of the Caucasus and Transcaucasia, subalpine woodlands of southeastern Transcaucasia have the appearance of sparse woodlands rather than thickets of dwarf, creeping woody plants. Such woodlands become progressively thinner with altitude and at about 2 700 m they are succeeded by meadow steppes or mountainous steppes. In the other, more humid regions, alpine woodlands pass into subalpine meadows. Similar to forests, subalpine woodlands are under pressure brought about by wood cutting and domestic stock grazing. In many regions, especially in the Greater Caucasus, subalpine woodlands serve as a buffer zone protecting forests from avalanches so that deforestation in the subalpine belt may be damaging to forests growing below (Belonovskaya and Zimina, 1990). The flora of subalpine meadows is extremely rich and there are many types of subalpine meadow communities. The three main ones are sedge, sedge-herbaceous, and herbaceous meadows. Sedge meadows develop in dry regions: meadows, dominated by Festuca varia, develop in the eastern part of the southern macroslope of the Greater Caucasus and in the southern Lesser Caucasus; meadows, dominated by Zerna variegata, occur in the central Greater Caucasus and in the eastern Lesser Caucasus. Herbaceous and sedge-herbaceous meadows develop in more humid areas. In the western Greater Caucasus, sedge-herbaceous meadows are most widespread, particularly the communities dominated by Calamagrostis, Festuca djimilensis, and Agrostis spp. Herbaceous meadows are usually represented by poly-dominant formations. However, sedge and sedge-herbaceous communities, dominated by one or two species, may contain many other species too. Thus, a typical Festuca djimilensis community comprises about 200 species, most of which are herbs and grasses, but sedges account for 60-70 per cent of the cover (Sniffers, 1953). Productivity of subalpine meadows is high. Plants usually reach 0.5-1 m in height and the above-ground phytomass reaches 0.4-1.0 tonnes ha-1 while total phytomass varies between 2.5 and 4.0 tonnes ha-1 (Gadzhiev, 1970; Bazilevich, 1993). Tall grasslands form another type of subalpine vegetation. These develop across the Greater Caucasus (especially in its western and central sectors) while in the Lesser Caucasus they extend to the Zangezur Ridge in the east and the Alagez in the south. However, nowhere do they form a continuous belt. Instead they develop on the north-facing slopes and in topographic depressions with fertile and well-moistened soils. Tall grasslands are composed predominantly of broad-leaved herbaceous plants which often reach 1.5-2 m in height. Gagnidze (1966) estimates that their flora contains 69 species, 52 of which are endemic to the Caucasus and 17 of which have a European distribution. Floristic composition varies between the regions. Communities, dominated by a single species (e.g., Hercaleum sosnowskyi or H. mantegazzianum; or a species of Senecio), are most widespread, although multidominant communities occur too, especially in the Colchis region and eastern Transcaucasia. Tall grasslands can be primary successions but they can also replace subalpine woodlands in which the herbaceous tier is formed by the same species. Tall herbaceous plants provide strong below and above ground competition to woody seedlings, impeding the regeneration of woodlands. This is very slow and is associated with areas of disturbed herbaceous cover and micro-elevations in topography. In turn, grasses experience competition from evergreen shrubs, especially rhododendron. Having invaded grasslands, rhododendron spreads quickly, eventually replacing other species. Because of this competition, tall grasslands do not develop in south-western Georgia (e.g., Guria and Adzharia), being limited to the limestone slopes of Abkhazia, which are unsuitable for rhododendron. Alpine meadows succeed subalpine communities developing generally between 2300-2700 m and 3700 m and at higher altitudes in eastern and south-eastern Transcaucasia (Figure 15.3). The main climatic and edaphic characteristics of the alpine belt, affecting plant growth, are low summer temperatures and short vegetative period, strong winds, poorly developed soils, large areas devoid of soil (e.g., rocks and scree slopes) and strong topographic contrasts. strong winds and high insolation ensure considerable evaporation while shallow and often skeletal soils fail to retain moisture and, despite a high amount of precipitation, plants often experience droughts. By contrast, on the lee side of slopes or rocks and in topographic depressions snow accumulates in winter and delayed melting affects both vegetative period and moisture regime. The distribution of snow in winter is of primary importance for the formation of vegetation patterns. The alpine belt, therefore, has a complex structure, often being split into small units with regard to both geomorphology and climate. Adaptations of plants to the climatic extremes of the alpine belt include their perennial habit, xeromorphic structure, small size and low height, and extensive root system capable of penetrating into rocky crevices. Gulisashvili et al. 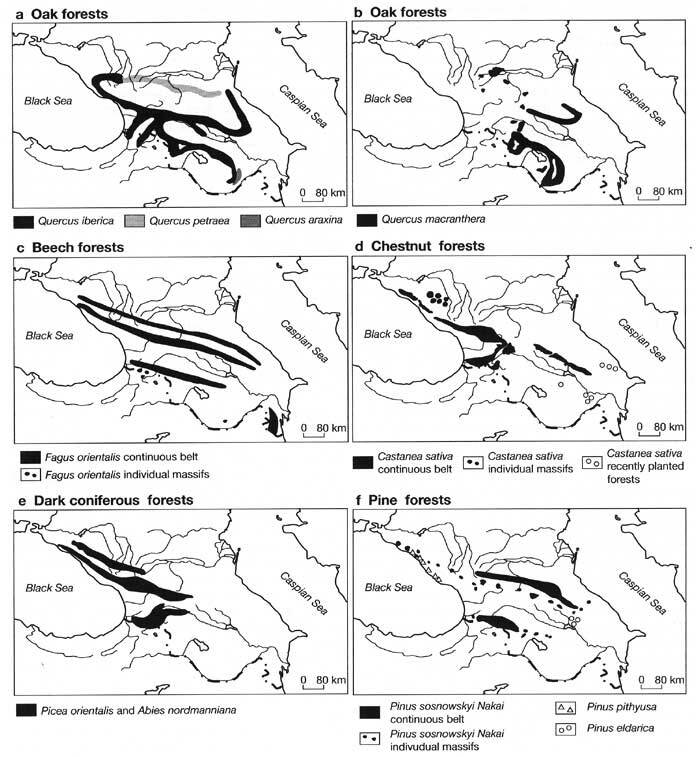 (1975) distinguish four main types of alpine vegetation in the Caucasus: alpine meadows; alpine mattes; impoverished alpine meadow communities; and vegetation of rocky habitats. The main zonal type is alpine meadows. These are dominated by sedges, especially Festuca, and species of Carex. They also contain many subalpine species but plants are smaller. Alpine mattes are meadows with a high participation of herbaceous species and a subordinated role of sedges and Carex. They develop in topographic depressions with well-developed soil cover, sufficient moisture, and good drainage. Plants usually have rosette-shaped leaves or a spreading habit and form a dense surface cover (hence its name: alpine mattes or carpets). Containing over 200 species, alpine mattes are distinguished by high diversity of species. Typical dominating species include Taraxacum stevenli, and species of Alchemilla, Potentilla, Primula, Geranium, and Campanula. Communities, developing in the more arid mountains of Armenia and Dagestan, comprise fewer species and are often dominated by one species, Sibbaldia parviflora, which is also typical of the alpine mattes damaged by excessive grazing. Impoverished alpine meadow communities develop in habitats where plants are exposed to frequent physiological droughts, and comprise species resistant to droughts and low temperatures. Impoverished communities are usually dominated by a single species such as Nardus stricta, Elyna capillifolia, and Kobresia persica. The Elyna and Kobresia meadows occupy vast areas between 2400 m and 3200 m, developing on flat watersheds, plateaux, and gentle slopes. They often form almost single-species communities where the participation of other species is insignificant. The Nardus stricta communities develop in topographic depressions with poor drainage. They are floristically poor, containing no more than 10-20 species. By contrast, vegetation of bare rocks is extremely diverse. Its composition depends on topography and chemical composition of rocks since this predetermines the reaction of the soil. Succulents and hemispherical cushion plants are typical as a result of the adaptation of plants to physiological droughts while in protected habitats dwarf shrubs develop even at very high altitudes.